If you looked up the definition of a 'quiet leader' you would probably find Brookfield East's Sam McGath's photo next to it. McGath is a talented sophomore, who has played key positions for the Spartans in football (quarterback) and basketball (point guard). "He's a quiet leader," second-year basketball coach Joe Rux said. "Sam is the kind of kid who will do what's asked of him. He is going to set the right example by how he conducts himself on and off the field. That's his strength right now. “I think all of us would like to see him take the next step in that role and be a little vocal and be more assertive as a leader. But that comes also with maturity. When you're thinking about a 15-16 year old, it's hard to have every quality." 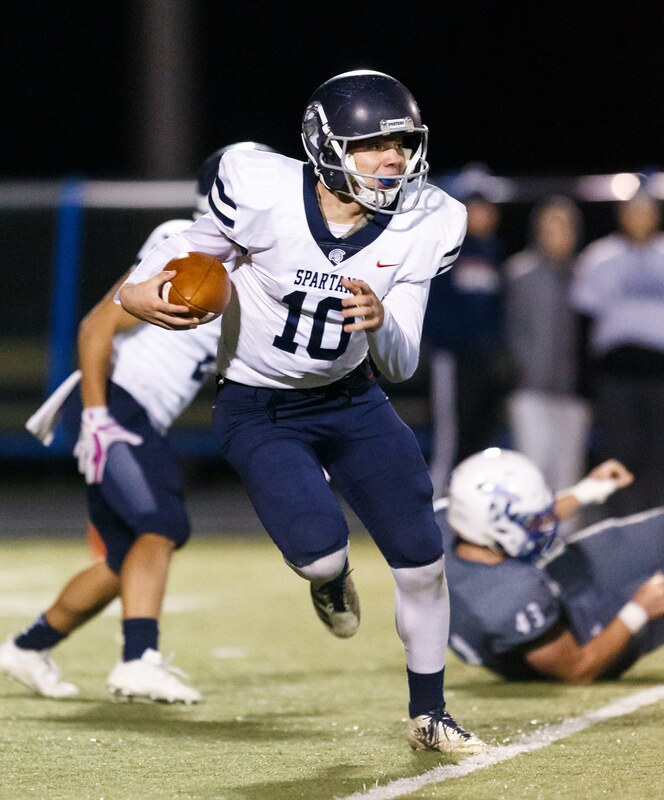 McGath, who started at quarterback last fall as a sophomore and led the Spartans to a 7-1 record in the Greater Metro Conference and a 10-2 overall mark, understands he is a sophomore and has a role. 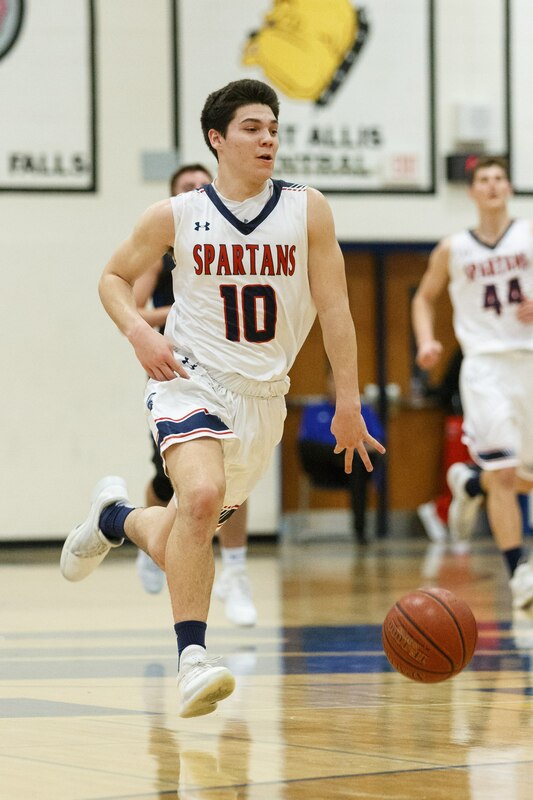 Photo by Al Herzberg, SportsPhotoLLC --- For the second straight season, sophomore Sam McGath started at point guard for coach Joe Rux and is one of the key reasons the Spartans are in a first-place tie with Brookfield Central in the Greater Metro Conference. Football coach Ben Farley talked about McGath's leadership style. "Quarterback is a natural leadership position and he leads by example," he said. "He is not a big rah-rah screamer. He doesn't know how to ever raise his voice. But a lot of people follow him. He is humble and doesn’t draw attention to himself." McGath, who started on the JV as a freshman, was moved to wide receiver and played with the varsity during the Spartans run to the state title. Last ​fallhe started at quarterback and earned second-team all-conference honors. Although he was a running quarterback - he rushed for 645 yards and 7 touchdowns - he also passed for 727 yards and 11 touchdowns showing his versatility. "As a quarterback you have to make sure your team is playing well," he said. "If someone is getting down, you have to make sure you're picking them back up and being a leader. "I enjoy running the ball and making the right reads, making the right decisions. But I need to improve my throwing accuracy and being able to get the ball there on time and in the right spot." His maturity didn't surprise Farley. "I was not surprised," he said. "He had a very good freshman year and started the last five games. He's a special kid, there's lot of poise about him, how he carries himself. You can't rattle him. "We brought him up to play wide receiver and to mainly block. But in the level 4 vs Menomonee Falls he was involved in a trick play and gained 40 yards." Farley also helped coach him in basketball his first year. "He started and was one of our best players," he said. "You got to see that first hand, his athleticism, his physical talent, he's a smart kid." Rux had the opportunity to see Sam play in the Jr. Spartans since he was hired in the spring before McGath's freshman year. "Obviously he's a natural athlete physically and he is mature for his age as well," Rux said. "While we were watching him in the youth games, we saw how focused he was and that was the giveaway. He was more advanced at the freshman level." As a result, he ended up starting for Rux as a freshman at the important point guard position. "He's a competitor. You can pretty much ask him to play defense on anyone you want him to," Rux said. "He's going to take that as a challenge and you can trust that with him. Photo by Al Herzberg, SportsPhotoLLC --- Sophomore Sam McGath led the Spartans to a 10-2 record last fall and finished second-team All-Greater Metro Conference. "There's not one thing where you look at Sam and say that's where he's really great. He's pretty well-rounded as a basketball player. But certainly on the defensive end he's really made a living. He's able to deny people and work hard and get some rebounds." Sam talked about his role with the Spartans and what he felt his strengths were. "Playing good defense, getting steals, doing the dirty work," he said. "Going to the hoop and driving. And getting assists and making sure everyone is playing well." But being a sophomore, Sam still has things to work on. "The biggest steps he can make is developing his shooting and work on going to the rim," Rux said. "It's hard when you are young going against kids who are more developed than you are. They're stronger and more athletic, so it makes it more difficult. "He's going to get stronger, he's going to get quicker with his releases, so the 3-point shot won't be as much of a problem. When he gets to the basket he'll be able to finish it." Currently, Sam is third on the team in scoring (8.6 points per game average) behind Patrick Cartier (20.8) and Thomas Francken (11.1), an improvement over his 5.6 points per game average his freshman year. He is tied for second in 3-point shots this year, the same as his freshman season. "I'm working on being a more consistent shooter," McGath said. "Being able to knock down open shots." McGath, who also is a sprinter on coach Mike Steiner's outstanding track teams, talked about what he likes most about basketball and football. "Basketball is fast paced, not that many breaks," he said. "It's fun running up and down the court. It's a team game, everyone has to work together. You have to know everyone's strength and you have to know you own strengths. What you can do, can't do, what other people can and can't do. "Football is fun because of the contact, being able to hit people. It's easily the biggest game in sports. It's fun being around the guys, in the weight room, the summer workouts." The Spartans have been one of the top-ranked basketball teams in the state this year. McGath was asked if he expected such success. "I knew we could be really good this year with have all the parts - especially Patrick in the middle - but I didn't know we'd be this good - but that we would have a better year than last year. Coach Rux is a good guy, a great coach, who pushes you to do your best and give 100 percent." The veteran Rux had his own thoughts going into the season. "In my 18 years of coaching, I don’t set any expectations on how low things can get or how high," he said. "I know it's a coaching cliché, but a good way to live. One day at a time. "It happens when it's ready to happen and here it was a scenario where we had kids who work hard. We were able to find some success this year and concentrate on little things." FAVORITE MOVIE: ​​'Sandlot,' Action movies. MOST MEMORABLE MOMENT: ​Winning state football championship as a freshman. WHAT DO YOU WANT TO DO IN THE FUTURE: Attend college and study Business. Would like to play football.